Tooth Coloured (Amalgam free) Fillings are the modern approach to restoring decayed and fractured teeth. Brynteg dental offer this modern technique to replace decay in new cavities and exchange existing amalgam restorations for a natural tooth like appearance. 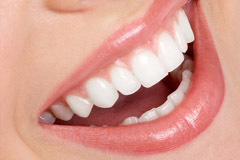 Tooth coloured restorations not only look great but we use the most up to date materials and techniques to a provide high quality function and a long lasting result. Various shades are available to match the surrounding teeth and the restoration is contoured to look like a natural tooth.